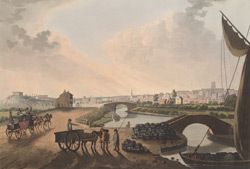 By the early 19th century, Nottingham was an expanding, prosperous town. It was known both as an industrial centre and as an elegant, well-built town. This picture shows a working scene: coal is being unloaded from a barge to take into the town. In the 18th century, Daniel Defoe noted: "The Trent is navigable here for vessels or barges of great burthen, by which all their heavy and bulky goods are brought from the Humber ... such as iron, block-tin, salt, hops, grocery, dyers, wares, wine, oyl, tar, hemp, flax &c. and the same vessels carry down lead, coal, wood, corn". In the distance the castle and several churches stand out from the town.